Diamondback moth Plutella xylostella is a major pest of canola and other brassica crops. DBM is a migratory pest in some seasons, so outbreaks are difficult to predict. Non-crop hosts (brassica weeds) can be abundant in wet summers and maintain local populations of DBM. Eggs (oval, cream, <1 mm) are laid on stems, leaf stalks and under-surface of leaves. The small green larvae wriggle violently when disturbed. Damage includes clear membranous windows in leaves. Monitor and record Because of the sporadic, unpredictable nature of DBM outbreaks, be prepared to monitor canola crops intensively each season. Check the crop at 5-7 day intervals using a sweep net. Recheck 5–7 days after a spray treatment. Take a minimum of 10 sweeps at each of 5 locations in the crop. Start at the edge and sample towards the centre of the crop (infestations may be higher at the edge). Increased sample numbers give greater confidence levels as distribution can be patchy. Also take note of the crop stage, number of beneficial insects and evidence of disease, and any visible damage symptoms. Rainfall (5-8 mm over 24 hours) can cause major decline in DBM populations. Larvae can be dislodged from plants and drown. Re-check after rain if a spray has been scheduled. Note: sweep nets are less effective when sampling dense tall crops. Egg parasitoids are effective in reducing crop damage (larvae don’t emerge from eggs), larval parasitoids will reduce the amount of damaged caused by larvae. 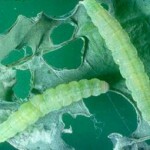 Diadromus does not prevent damage to the crop by the larvae it attacks at pre-pupae and pupae, but is important in overall population control. Rapidly increasing, large populations of DBM will not be controlled by beneficial insects. However, small populations may be contained by the activity of parasitoids and predators. Outbreaks of the fungal disease Zoophthera radicans can cause greater than 90% reduction in DBM population density following a period of warm temperatures, rainfall and high humidity. Diseased larvae become yellow, sluggish and swollen before dying. Dead larvae are white, brittle, flat and covered with fungus. DBM does not diapause, so needs a year-round source of hosts to survive. Control weed hosts in adjacent paddocks which allow build up of DBM. Self sown canola pre-cropping will contribute to DBM population build up. Monitor forage brassicas in proximity to canola, they may be a source of DBM. an average of >30 larvae per 10 sweeps for pre-flowering, moisture stressed crops. an average of >50 larvae per 10 sweeps for pre-flowering, unstressed crops. If the DBM numbers are well above or well below threshold, 5 sets of 10 sweeps is sufficient to make a management decision. More sampling is required if average is near threshold, or re-check the crop again at a shorter interval e.g 2-3 days. Research conducted in the 1980s show that from late flowering to pod-maturity, a 40% loss of foliage was needed to cause a 5% yield loss. Chemical control DBM is a difficult pest to control with insecticides alone. DBM rapidly develops resistance to insecticides, and sustained insecticide use e.g. synthetic pyrethroids, will result in locally high levels of resistance. It is critical that an integrated approach to DBM is considered, rather than total reliance on conventional chemistry. Good coverage is essential for effective control. Sprays must be able to target the significant portion of the population in the lower canopy. Target small larvae (<5 mm in length) for maximum efficacy of Bt and insecticides. Be aware of withholding periods of any products used for DBM control. A 2-spray strategy can be more successful than a single application. This strategy aims to kill survivors, or newly hatched larvae in the second spray. If using this tactic, it is essential that insecticides are rotated. Consider spot spraying for outbreaks at edges of field or where DBM are moving from areas of weed hosts. This approach may suppress these populations and prevent further spread across the field. Late season control is less economic as the impact on yield is reduced once crops have formed most pods. Spray at dusk for greater effectiveness; Bt breaks down quickly with exposure to UV. If control failures occur, send in samples of DBM survivors for early resistance testing if a service is available. Consider an Area-wide management strategy in canola-growing regions. Other pests that occur at the same time as DBM include; aphids, helicoverpa and Rutherglen bugs. Where possible – always consider the use of biopesticides first, as these do not impact on other pests/beneficials. Bt can provide effective control of DBM and small helicoverpa. Synthetic pyrethroids (SP) may provide control of aphids, helicoverpa and Rutherglen bug, but kill beneficials and are unlikely to control DBM because of resistance. Note that green peach aphid may also have resistance to SPs. Communication An area-wide approach to DBM management (non-crop hosts, insecticide use and resistance management strategy) where outbreaks are severe and insecticide resistance is a growing issue may be useful. Industry publications provide up to date regional information about pest activity in crops. Ramachandran, S., D. Buntin, et al. (2000). “Response of canola to simulated diamondback moth (Lepidoptera: Plutellidae) defoliation at different growth stages.” Canadian Journal of Plant Science: 639-646.